From some of the earliest written records it seems certain that the domestic cat first arrived in Japan from China or Korea at least 1,000 years ago. The Japanese Bobtail breed has certainly existed in Japan for many centuries and it is featured in many ancient prints and paintings. 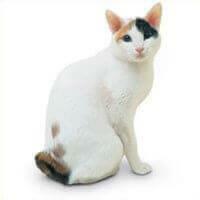 The longhair Japanese Bobtail has existed for centuries in the Orient as has the shorthairs. Japanese Bobtails are strong and healthy cats and they usually have litters of three to four kittens that are extremely large for newborns. Compared to other breeds, they are active earlier, walk earlier and start getting into trouble earlier. Kittens are never born tailless, nor are they born with full tails. They are active, intelligent, talkative cats and their soft voices are filled with a range of tones - some owners swear that their cat "sings". They can be a little bit "dog-like" like in that will carry things in their mouths, and will also love to play a quick game of catch with you and they also love to pounce on everything and it is a real thrill to watch. It is an animal that will not frighten easily and they adjust to dogs and other animals, and are especially good with children. Usually breeders will make the kittens available between 12 and 16 weeks of age. After 12 weeks kittens should have had their basic injections and developed the physical and social stability needed for any new home that they might be going to. This charming cat will enjoy some toys, a scratching post and of course YOU for having a healthy, long and happy life.